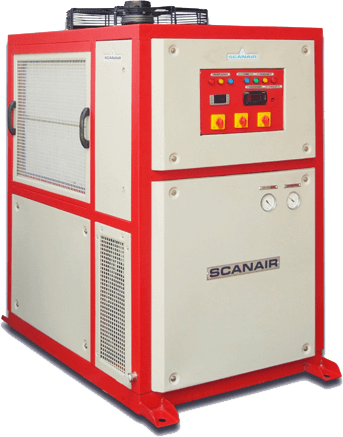 Scanair Water Source or Ground Source Heat Pumps can be designed with closed or open loops systems, and those loops can be installed either horizontally or vertically. The type chosen depends on the available land areas and the soil and rock type at the installation site. These factors will help determine the most economical choice for installation of the ground loop. For closed loop systems, water or antifreeze solution is circulated through plastic pipes buried beneath the earth’s surface. During the winter, the fluid collects heat from the earth and carries it through the heat pump system and into the building. During the summer, the system reverses itself to cool the building by pulling heat from the building, carrying it through the system and placing it in the ground. This process creates free hot water in the summer and delivers substantial hot water savings in the winter. Open loop systems operate on the same principle as closed loop systems and can be installed where an adequate supply of suitable water is available and open discharge is feasible. Benefits similar to the closed loop system are obtained. 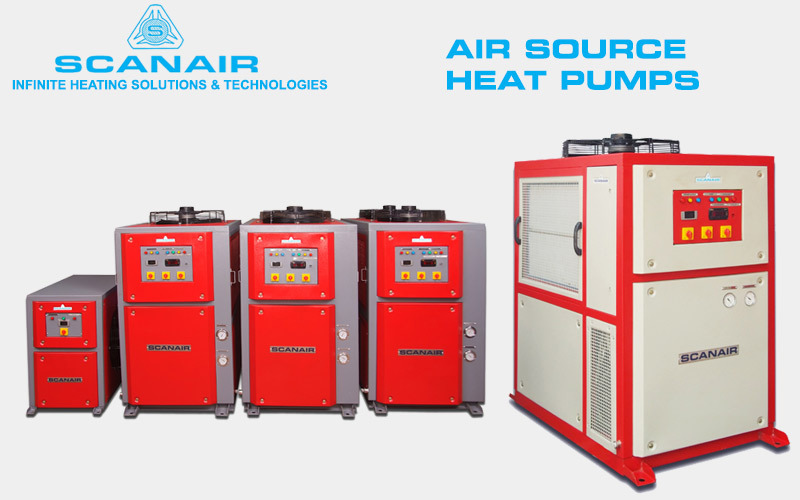 Scanair Water Source Heat Pumps are the definition of Green Technology. Our heat pumps can harvest the free energy provided by the earth and sun to produce the most energy efficient water heating available. We utilize non-ozone depleting refrigerant to transfer energy from a low quality heat source to a high quality hot water supply. 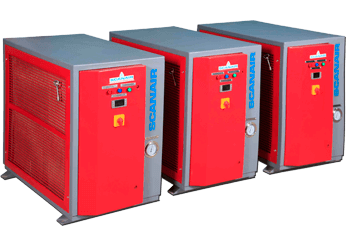 Scanair heat pump water heaters have zero emissions and further reduce your carbon footprint by maximizing efficiency and minimizing electricity consumption. The application of a water source heat pumps for aquaculture water heating is the most energy efficient way to heat up fresh or salt (sea) water. You can heat up your pond for only minimum of the cost that other traditional methods might costly solution. Each year we receive more and more requests and inquiries for heat pump applications in aquaculture. The benefits are many and your investment will pay back immediately in monthly savings varies LPG gas or electric element heaters. 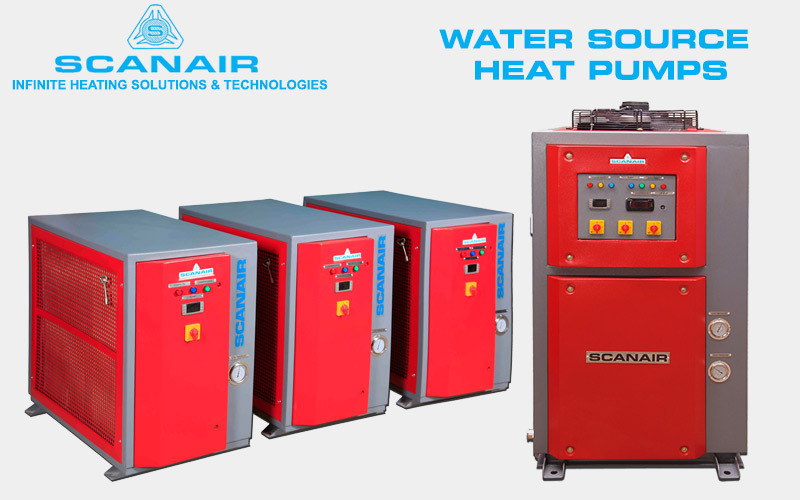 Scanair water source heat pumps manufactured for rugged, round the clock working units because our products have a Titanium Heat Ex-changer, Titanium being the safest metals to use in fresh or sea water applications to protect the aquatic life from the harmful components or metals like copper that most common heaters have. We use digital display thermostats and world class scroll compressors with titanium heat ex-changers all designed to keep the right temperature in warm and in cold weather. These components will assure the long life and reliability of your equipment and will let you feel at ease knowing that your investment is being taken care of. Our heat pumps come in HEAT and COOL versions a full range of capacities, and models available depending on your application and needs.